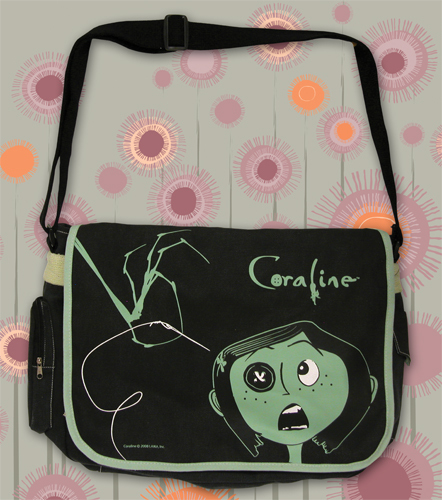 Take your gear on the go with this great Coraline messenger bag. Featuring creepy fun graphics, this roomy accessory is just what you need to carry all your stuff! Large main compartment measures about 16x12x4″ and has a Velcro flap. Plus there are two outer pouches on the sides (one zips, one is Velcro). Sturdy cotton canvas bag has an adjustable strap. Get yours today!